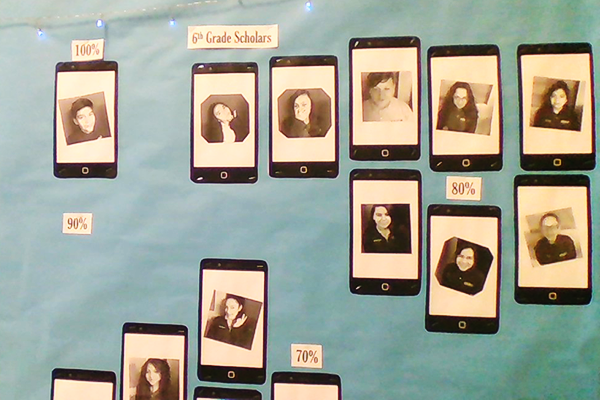 Kenya Perkins, a fifth and sixth grade teacher, wanted to create a board that had something in common with her students in their everyday life. She explained, "I intertwined an Instagram wall with their pictures and had them all take a picture and do a pose as they would on an Instagram account. This was for my fifth and sixth grade scholars. You can print the iPhones as big as you want. It came out great! Although these weren't color pictures, the students and I loved the final outcome. I also added little lights for that special touch. I also blew up the Instagram logo and painted it. This was great because the next day all the kids were at the wall waiting to see how their pics came out. 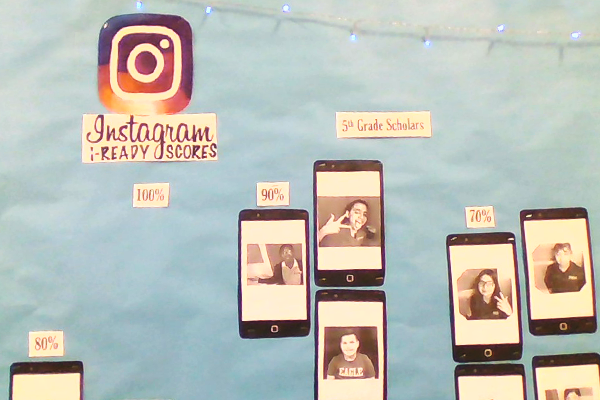 I also had a HUGE improvement on their scores when I mentioned that I'd be doing an "Instagram Wall" for my students' achievements. I think the kids wanted to make sure their pics made the wall. They also were proud of seeing their achievements."